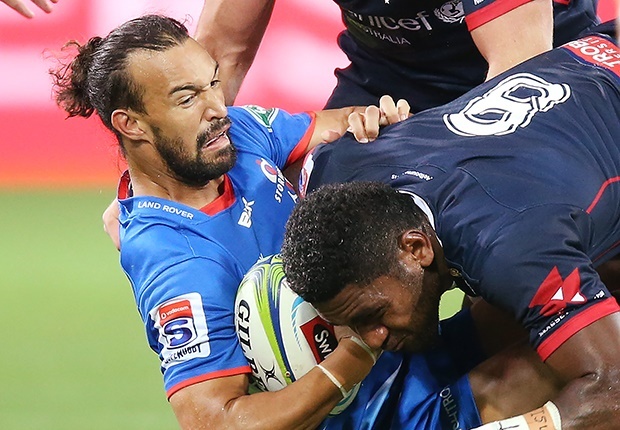 Left wing Dillyn Leyds was sublime in the Stormers' upset 41-24 win over the Rebels in Melbourne on Friday. Leyds scored the game's opening try in the third minute and it was a brilliant 35m individual effort in which he evaded several Rebels defenders. Leyds was omnipresent in a much-improved Stormers attacking effort and helped set up a further two tries. According to statistics derived after the match, Leyds beat eight defenders and made 68m on attack. On a side note, Stormers centre Ruhan Nel also deserves a mention as he bagged a brace of tries and made 119m on attack. I picked Nel as my emerging SA player before the competition but before Friday he had endured a torrid season, before finally showing what made him such a standout on the sevens circuit. The Lions' 31-20 defeat to the Brumbies in Canberra leaves them in a precarious position ahead of daunting tour matches against the Chiefs and Crusaders. Given what's transpired for the Lions over the past fortnight, it's hard to see them notch a win on tour and their current position of ninth overall could be even worse when they return home. The manner in which they've been outclassed in recent weeks shows that they are struggling to combat the loss of key campaigners abroad as well as injuries. Let's hope the return of captain Warren Whiteley can help save the men from Johannesburg's season. When the Sharks thumped the Lions 42-5 at Ellis Park I said it was one of their best performances in years. And this past weekend's 51-17 demise to the Jaguares at Kings Park was surely one of their worst. It was the same old story of dropped balls, lacklustre execution and at times non-existent defence. To illustrate how poor the Sharks' execution was: they made 516m on attack compared to the Jaguares' 335, had 141 ball carries compared to the 85 of the visitors, beat more defenders (22-17), completed 168 passes to 103, yet somehow conceded seven tries and 51 points! After losing their past two home games, the Bulls made sure they avoided another upset by scoring five tries in dispatching the Reds 32-17 at Loftus Versfeld. There's no doubt that returning Springboks Warrick Gelant, Jesse Kriel, Handre Pollard, Ivan van Zyl, Marco van Staden and RG Snyman to the starting team made a difference. Coach Pote Human perhaps made a mistake by resting a Springbok or two too many against the Jaguares and will more carefully consider his approach for the remainder of the campaign. It was also good to see the return of lock Snyman after a long injury layoff. The 2.06m beanpole made a definite impact and the statistics reveal he completed 12 carries, 55m with ball in hand and beat as many as four Reds defenders. Following the Stormers' upset win over the Rebels - and the Sharks' loss to the Jaguares - the South African Conference appears wide open with not much to choose between the sides. Only five points separate the first-placed Bulls and the last-placed Lions, while the Sharks, Jaguares, Stormers and Lions have all won four and lost four. The Stormers however are the only team to have completed a tour to Australasia and will fancy their chances of creeping up the table in the coming weeks. The inconsistency of all the sides means that picking a winner for the conference is tricky. However, don't expect any of the South African teams to challenge for the title in 2019. In fact, at present it appears as though the Crusaders - who are 11 points clear at the top of the standings - will coast to a 10th Super Rugby title.